In an unassuming, box-shaped building just off of the University of Miami campus, a team of university employees is planning what the campus will look like in five years. 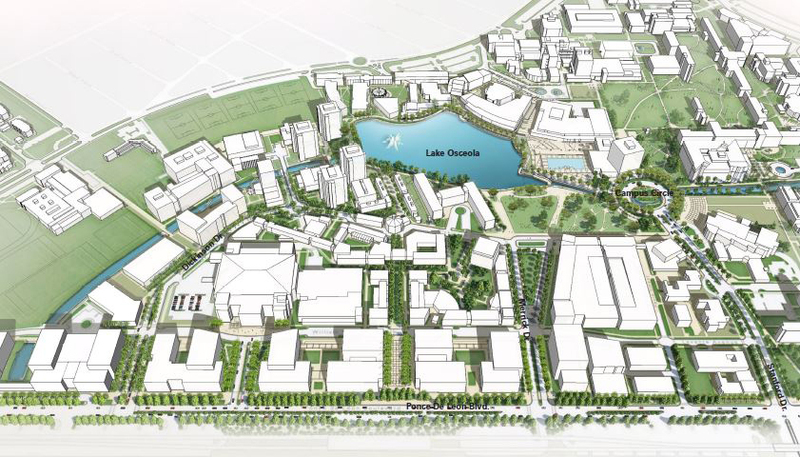 By 2020, the Campus Planning and Development Department envisions a pedestrian bridge by the Lakeside Patio, a parking garage next to Pavia Garage, a residential hall near the BankUnited Center and a wider walking path around Lake Osceola. Janet Gavarrete, Associate vice President of Campus Planning and Development, explained how she and her team make changes depending on what has worked in the past and what the campus needs in the future to create “a more livable, enjoyable, practical and safer” campus. But planning so many projects involves multiple moving pieces and is puzzling to Gavarrete and her colleagues. The first pieces that need to be laid down are the lake pathway enhancements and a pedestrian bridge connecting the Lakeside Patio to the area by the Eaton Residential College parking lot. “We need to plan well in advance, because when we have more people living on campus, we’re going to have more people walking on campus, and so we’re going to need more room to walk, just like we need more room to teach,” Gavarrete said. The broader pathways, which the department hopes to expand to about 15 feet around most of the lake, and new bridge are “vital” for the campus. The wider pathways and bridge are expected to be complete by the start of 2016. Without them, the next planned project (the Merrick Garage that will stand next to Pavia Garage) would be impossible. The Merrick Garage will add approximately 860 parking spaces. They are needed so that patients of the under-construction Lennar Foundation Medical Center can park at the Ponce de Leon Garage next to the Flipse Building. Students who park at the Ponce de Leon Garage would start parking at the Merrick and Pavia Garages, which would increase the amount of foot traffic from those garages to the University Center and Student Activities Center. The garage is slated for completion in 2016. The new residential hall by the Fieldhouse and Rhodes House will add around 1,000 beds for students, bringing the total number of students living on campus to 5,200. The campus currently houses about 3,600 students living throughout the five residential colleges: Eaton, Mahoney, Pearson, Hecht and Stanford. Gavarrete hopes to have housing finished by 2018. This five-year development plan will then allow the Campus Planning Department to take down the Hecht and Stanford residential colleges, which house first-year students, in its next five-year plan.